This King Seiko Chronometer is one of the most beautiful King Seikos I've ever seen. 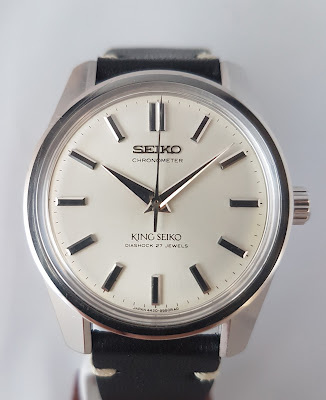 If you're not familiar with King Seikos, they existed in the 1960s and 1970s concurrently with early Grand Seikos. After the Quartz Crisis mercifully ended, Seiko resurrected its mechanical Grand Seiko, but not the King Seiko, which is a shame because King Seikos -- and especially this one-- are among the most beautiful and elegant dress watches you can wear. This 44KS from Ikigai Watches has been ticking at 18,000 bph since 1964. Ikigai Watches is one of the world's most renowned vintage Seiko shops. (I've bought two watches from them, with five-star results.) Their watches come pre-serviced. Grand Seiko has made a significant push in the American market by opening Seiko boutiques and transforming Grand Seiko into a separate entity. With the growing interest in Grand Seikos has come a steady rise in prices for vintage Grand and King Seikos (as well as for their cousin, the Lord Marvel). The good ones, like this 44KS, are going fast. 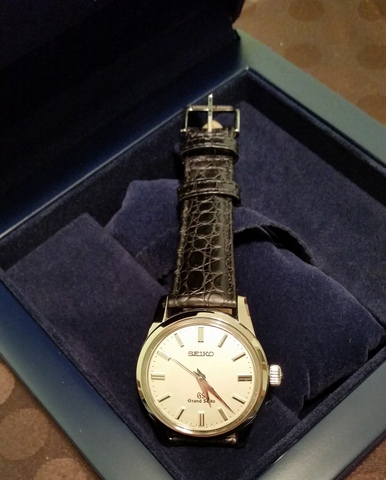 This King Seiko is worth every penny of its $2090 price. This magnificent specimen is a 1960s Oysterdate, reference 7939. It looks like was made in 2018, with vintage vibe sprinked on. 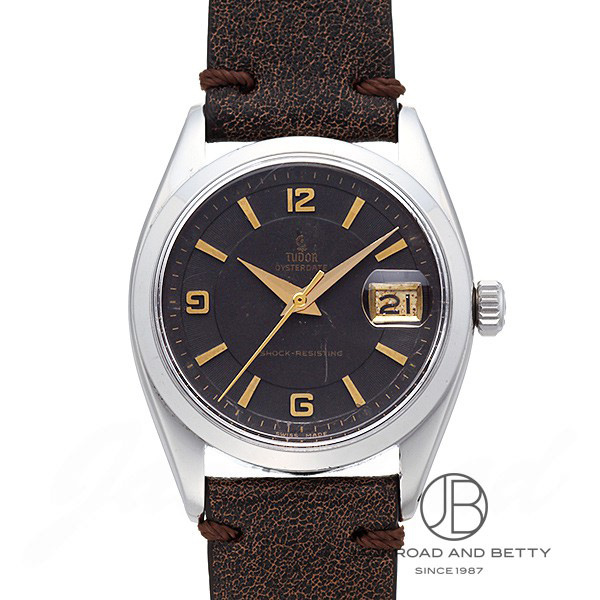 It uses a manual winding caliber 425. JackRoad in Tokyo is selling it for $1652, less if you're not a Japan resident and able to take advantage of tax free buying. If you're new to JackRoad, it's a shop in Nakano Broadway with perhaps Japan's best selection of vintage and used watches. I've bought there with very happy results. I've watched Omega's blue Snoopy Award Speedmasters increase steadily in value over the years, roughly about $750 in sale price every twelve months. There are a few for sale on Chrono 24 including this and this. Produced in the early 2000's, the Snoopy Award Omega is a rare as it is spectacular. The Snoopy Award watches come in two colors, blue and white, but I like the blue one more. 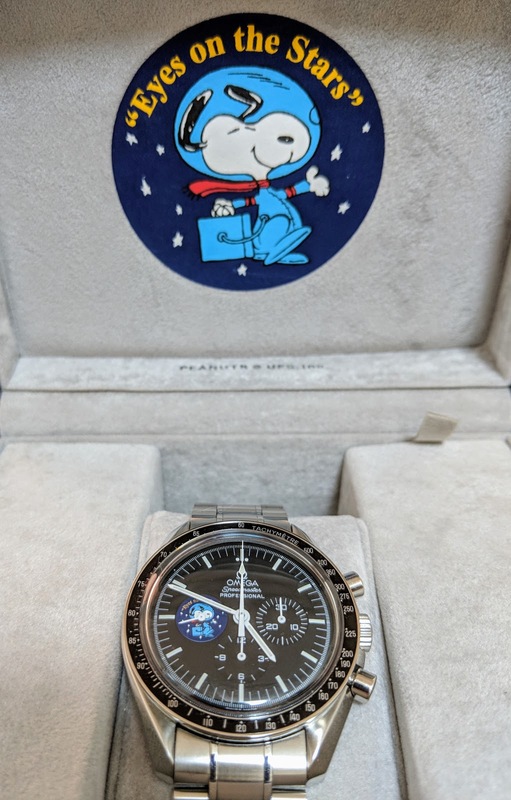 This Snoopy Award Speedmaster increases in value every year. The Snoopy Award was given by NASA's astronauts to members of their support team who helped make their missions a success. These are manual wound, 42 mm, steel watches. The Snoopy Award Speedmaster makes a great first Omega Speedmaster or a terrific addition to your Speedy collection. Figure on spending between $11,000 and $15,000 on one, but more if you wait. A Better Wrist was born in June 2015. Enjoy the informative, fun and insightful articles you read here. What Are Grand Seikos Made Of? Sugar and Spice and Everything Nice? Do you need help buying a watch in Japan, and having it sent to your home country? Visit Japan Watch Hunter for help. If you haven't had enough to read about watches here, you can visit us on Facebook. And why not? Twitter, too. Did you spot a problem with this website? Did we make a typo? Do you want to use one of our articles or photographs on your website or elsewhere? Please use the contact form above or the email address below to get in touch with us. This website is copyrighted by Bill Adler. All photos on this website were taken by Bill Adler, unless otherwise noted. Photos, videos and written material may be used on your website or blog (but not anywhere else) without prior permission as long as you do the following: 1) Include our website's name, A Better Wrist, and URL, www.abetterwrist.com, in your post, 2) let us know that you've used an article or photograph from us, 3) and not use our material on a regular or frequent basis. If you want to borrow articles and photos regularly, please ask us in advance. Do you use an ad blocker? That's okay. Although we're advertiser supported, we understand why you want to block ads and won't ask you to stop. A Better Wrist is an advertiser supported website. Advertisements may appear around articles or within articles. In addition, A Better Wrist articles may include affiliate links to commercial websites within articles. Sponsored and referral links to companies may also appear within articles and elsewhere on our website. For information on advertising on A Better Wrist use the contact form on this page. (c) Bill Adler. All rights reserved. Awesome Inc. theme. Powered by Blogger.